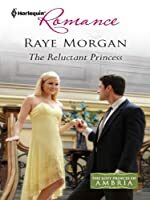 Betrayal made her flee her fairy-tale life inside the castle. Now Kim Guilder is struggling to raise her illegitimate baby alone in exile. Jake Marallis has been tasked with bringing the runaway princess home. The last thing he needs is to fall for Kim... With treachery everywhere -- and his feelings for Kim and the baby growing by the day -- Jake's only choice is to speed them to safety! For, alone they are defenseless, but as a family they just might save the kingdom...and themselves!